How to configure the Ranger HDFS Plugin for SSL, when setting up Ambari Ranger SSL using self-signed certificates. The following steps show how to configure the Ranger HDFS plugin for SSL. You can use the same procedure for other Ranger components. Stop HDFS by selecting Service Actions > Stop. Change to the Ranger HDFS plugin directory and create a self-signed certificate. When prompted, provide an identifiable string as the value for the "What is your first and last name?" question. then provide answers to the subsequent questions to create the keystore. When prompted for a password, press the Enter key. Important note: In the case where multiple servers talking to ranger admin for downloading policies for the same service/repository (e.g. HBase Master and Region servers, multiple NameNodes or Hive servers in an HA environment, be sure to use the repo name or a common string across all of the nodes (such as HbasePlugin, HdfsPlugin etc). (Note this and enter the same value in Common Name For Certificate field in the edit repository page in the Policy Manager UI). Create a truststore for the agent and add the Admin public key as a trusted entry. When prompted for a password, press the Enter key. Under Ranger Settings, provide the value in the External URL box in the format https://<hostname of policy manager>:<https port>. xasecure.policymgr.clientssl.keystore -- Enter the location of the keystore created in the previous step. xasecure.policymgr.clientssl.keystore.password -- Enter the keystore password. xasecure.policymgr.clientssl.truststore -- Enter the location of the truststore created in the previous step. xasecure.policymgr.clientssl.truststore.password -- Enter the truststore password. Select Advanced ranger-hdfs-plugin-properties, then select the Enable Ranger for HDFS check box. 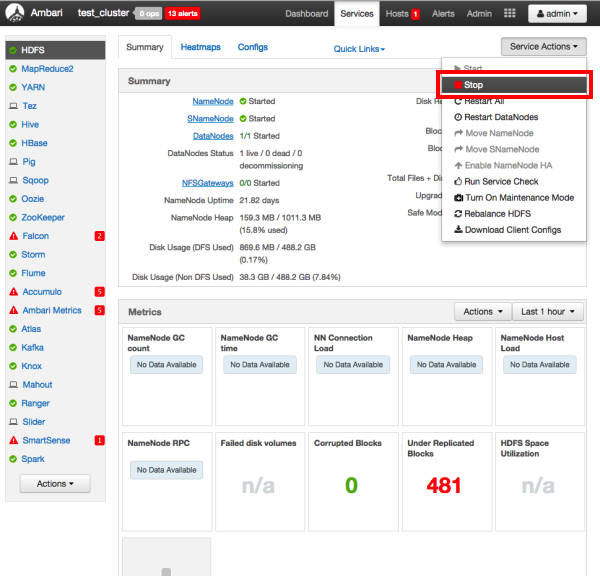 Start HDFS by selecting Service Actions > Start. Stop Ranger Admin by selecting Service Actions > Stop. Add the agent's self-signed cert to the Admin's trustedCACerts. Log into the Ranger Policy Manager UI as the admin user. 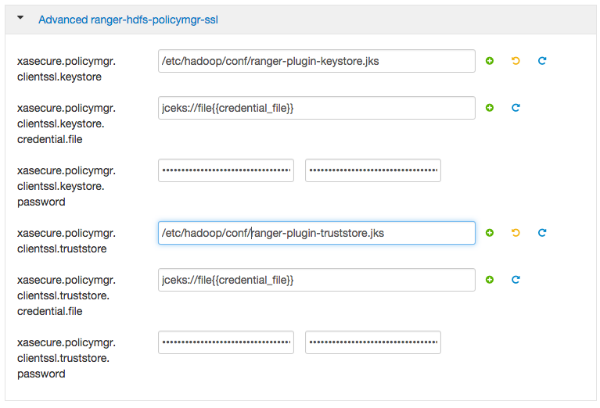 Click the Edit button of your repository (in this case, hadoopdev) and provide the CN name of the keystore as the value for Common Name For Certificate, then save your changes. In the Policy Manager UI, select Audit > Plugins. You should see an entry for your repo name with HTTP Response Code 200.